There are plenty of people throughout the country that wish that they could completely overhaul the look and functionality of their bathrooms. The trouble is, they don’t know all of the options out there or what they can actually afford to do with the budgets that they have. If you were to seek out the advice of a seasoned professional in the bathroom remodeling field, you might gain a unique insight into the layout and products that can take your vision into real life. Fortunately for you, we have the expertise and professionals who are more than willing to divulge some cool ideas and concepts that can start you planning out your bathroom remodel today. While there are certainly ways that you can improve your bathroom on a strict budget, splurging never hurt that much either. You have to consider the fact that you will be using this bathroom every single day, so why not add in a few elements that are sure to make it an enjoyable and comfortable experience for you and everyone else in your house? Things like a steam shower, heated tile and a warming drawer for towels make an elegant statement to anyone who uses your bathroom, and also just adds a bit of luxury into your daily life as well. There are so many people that seem to be stuck with the idea that they have to have a bathtub in the bathroom. While some people are still bath takers, most of the world just doesn’t have time for a leisurely soak anymore. With this in mind, you might save the floor space and the money wrapped into a nice new bathtub and seriously upgrade your shower instead. You can purchase a large walk in shower with seats and storage for roughly the same cost as adding a traditional shower and bathtub separately. The only exception to forgoing the bathtub is if you intend to sell the house in the future. Buyers enjoy seeing both a shower and a bathtub, regardless if the intend to actually use the bathtub. Hand painted porcelain tiles are starting to trend in high end bathrooms around the world, but this eats up a lot of the average budget for a bathroom remodel. Instead of choosing this, you might instead look into options that have that same look and feel, but aren’t actually hand painted. If you are trying to stay within a strict budget, you might opt for materials that provide an illusion of high end construction and use whatever you have left in your budget on things like accents to pull the whole room together in a great way. Younger people and middle aged couples might not be considering the possibility of aging in the house that they are living in. Ease of access into bathtubs and showers should find their place into your design or its possible you may find yourself paying for another remodeling project down the line. Curbless showers, walk in tubs, rails and non-slip floors can make all the difference as you age. Consider letting one of our remodeling contractor professionals seamlessly tie in these features in an elegant way. 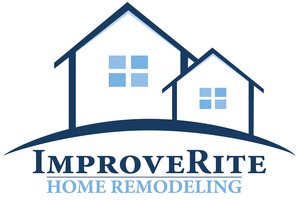 If you are interested in a bathroom remodel, give ImproveRite a call now and let our remodeling contractors help you jumpstart the process.